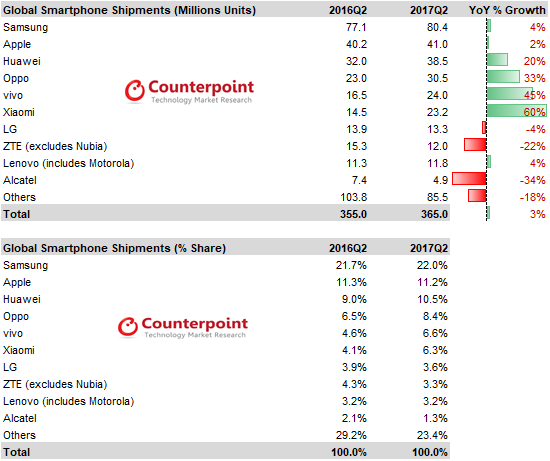 According to the latest research from Counterpoint’s Market Monitor service, global smartphone shipments grew 3% YoY in Q2 2017. Chinese brands now hold a record 48% smartphone market share worldwide as these brands continue to scale aggressively beyond mainland China. Global smartphone shipments grew 3% YoY reaching 365 million units in Q2 2017, a second quarter record. Top 10 brands account for almost 76% of the smartphone volumes in Q2 2017. Xiaomi, Vivo, Oppo & Huawei were the fastest growing Chinese brands outside China with their mix of overseas smartphones shipments increasing YoY. China, India and South East Asia remain the key growth markets for Chinese brands. A Chinese vendor continues to hold one of the top three spots in most of these markets. Almost 1/3rd of the combined shipments of these brands are to markets outside China. Samsung led the smartphone market by volume with a market share of 22% in Q2 2017. Its smartphone shipments recorded a marginal growth of 4% annually during the quarter. Samsung shipments remained almost flat quarter on quarter. Average selling price of Samsung smartphones increased due to strong shipments of S8 and S8+. However, shipments of mid-tier A series and low send J series declined sequentially. Demand for older generation iPhones remained strong in markets like Russia, India, Vietnam, Indonesia and other fast growing markets. Many users are likely to delay their purchase of a new iPhone in anticipation of the much awaited iPhone 10th anniversary edition which is expected to be a super-cycle for Apple – though supply-side challenges might limit the initial volumes available. Apple’s decline in China continues as Oppo, Vivo and Huawei posted record Q2 2017 shipments in China. Huawei shipped record second quarter shipments of 38.4 million units, up 20% annually driven by strong performance in emerging markets. In China, Huawei continued to capture the top spot in 2Q17 ahead of rivals OPPO and vivo, shipping higher volumes into the channels. Huawei’s Nova and Enjoy series, along with flagship P10 were in strong demand during the quarter. Huawei’s share in the premium segment also expanded due to the strong performance of its Mate and P series. Oppo and Vivo were the fourth and fifth largest brands during the quarter, capturing market share of 8.4% and 6.6% respectively. Both these brands posted record quarters in India, their strongest market outside China. Xiaomi emerged as the fastest growing brand YoY (+60%) surpassing Vivo (+45%) & OPPO (+33%) which were the fastest growing brands in the previous quarter. Xiaomi shipped 23.2 million smartphones, capturing 6.6% market share of the global smartphone market in Q2 2017. The key reason behind the Xiaomi’s comeback can be attributed to strong demand for its latest flagship Mi 6 and low-tier models such as Redmi Note 4X. In addition it has focused on diversifying its distribution channel mix in both China and India, its strongest market outside China. LG registered 13.3 million smartphone shipments in Q2 2017 with strong performances in Asia and Europe. The company’s shipments declined 4% annually during Q2 2017. Its shipments in North America also declined sequentially because of lower than expected sales of its flagship G6. ZTE was the 8th largest brand capturing 3.3% market share during the quarter. 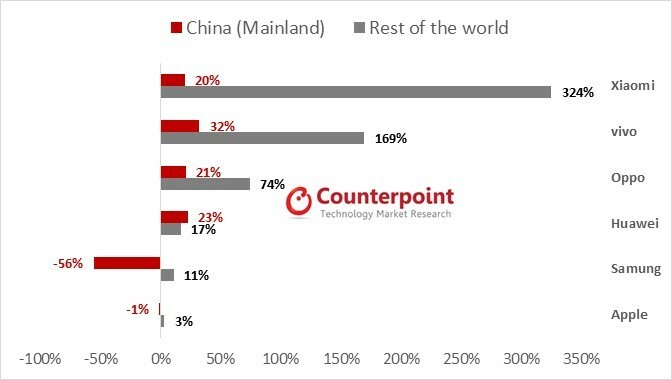 Lenovo and Alcatel continue to face tough competition in high growth markets like India, LATAM which led to the flat or declining market share respectively, during the quarter.